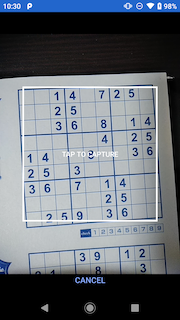 This app "Number Place Auto Solver" can capture the question by taking the picture of the Number Place (Sudoku) question, and solve it automatically instead of you. 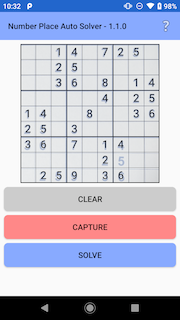 Just after this app started, all 9x9 cells are blank. 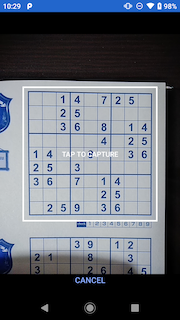 Tap "Capture" (Red button), then the camera screen will open. 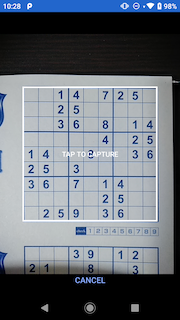 Tap inside the white frame on the camera screen after adjusting the position and tilt of the camera so that Number Place question just fits in the white frame. Then the camera screen will close. 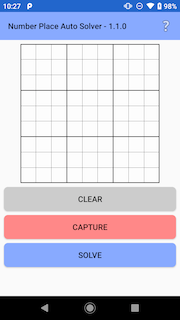 Then the question (whole 9x9 cells) will be extraced (*1) and shown on the screen, and the numbers of each cell are recognized (*2) and shown on it. 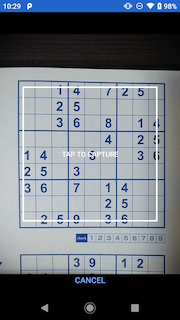 (*1) If the question (whole 9x9 cells) cannot be extracted well, the area within the white frame will be treated as the question when taking the picture. In such case, the numbers for each cell will not be recognized or may be misrecognized. Please try the following ideas when taking the picture. The question (entire 9x9 cells) is taken smaller than the white frame. Please bring the camera closer to the question. The question is taken out of the white frame. Please keep the camera away from the question. The question is taken in a trapezoidal shape. Please make the camera parallel to the question. The question is being shot diagonally. Please rotate the camera slightly left or right. (*2) If the question is printed on the booklet, it may be incorrectly recognized because the printing of the back page is transparent. It is recommended to pinch a dark underlay or the like. To correct the number in the cell, please tap the cell to open the keypad to enter the number. Then tap the number or blank button, the number or blank will be input in the cell and the keypad will close. If you tap "X"(red button) on the keypad, the number will NOT be changed. 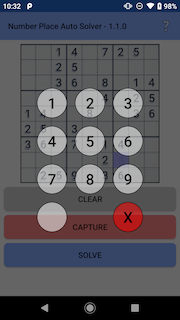 After you enter all numbers just like the Number Place question, tap "Solve" (Blue button) and the solution will be displayed on the screen. If the message "Invalid Question" is displayed, the numbers in the red cells are duplicated in the vertical row, the horizontal row, or the same block. 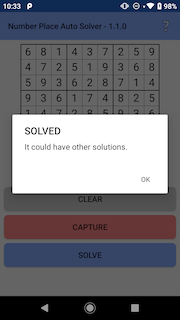 Please correct it and tap "Solve" again. This app uses "tess-two" Library under Apache License Version 2.0 as OCR function. 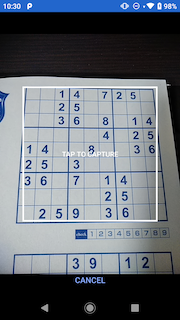 This app uses "OpenCV" Library under 3-clause BSD License as image recognition function.